Today was spent preparing for the first week of Block a Day. I pulled fabric from my newly organized stash drawers. There was enough fabric for the first week of blocks. Then, I went to Hobby Lobby and I purchased a few extra fabric pieces. There is a gift card burning a hole in my pocket. JoAnn’s is having a 20% off the entire purchase next Senior Wednesday. If I can hold out that long, I will go fabric shopping next week. I spent part of the day trying to learn how to use my new Activon Camera. This was given to me so that I can record my hikes and bird watching. I would also like to record some of my quilting process. I learn so much from reading other people’s blogs, and I would like to contribute my learning process. However, I am having a bit of difficulty in learning how to use this camera. Thankfully, there are many tutorials. I have some studying to do! A few weeks ago, I purchased The Quilter’s Planner 2017. When I started quilting and sewing, I started keeping a journal in spiral notebooks and in composition books. I used these journals to put fabric swatches and photos of the product, along with notes about the product. The Quilter’s Planner caught my eye because it is well constructed. It would be nice to have it all in one place, instead of in different journals. The calendar is exactly what I need. When I retired, I thought I would never use a calendar again. I need it now, more than ever. It has a section of useful information. It also provides a block for each week. I’m thinking I might try piecing some of these blocks. The Blue Stencil Film I ordered arrived today. My plan for tomorrow is to make the templates for the first section of Block A Day. After a morning of procrastination, I got to the business of sorting and organizing my fabric stash. Surprisingly, it only took a couple of hours. And, there is room to spare! I have small fabric remnants sorted by colors. It was difficult, but I did end up getting a bag of scraps ready to donate. A friend of mine had told me she knows where they will be accepted. There are bins with bags of strips and squares. The Block A Day book has a few blocks that call for strips and squares. There are also bins with specialty fabric remnants, such as super heroes etc.. I am keeping those because there is still enough to make totes, small fabric baskets, and other items. There is no room for a design wall. I tried the table cloth, but the place where I thought I could hang it is not easily accessible. Now, I am off to cleaning my sewing machine! The Christmas holidays were filled with family, friends, food, and fun. After spending the morning watching old movies, I thought it would be a good idea to assess the stash bins and start reorganizing the sewing room. It was a good idea…but, as usual, I got side-tracked. As I was pulling out remnants, I started thinking of the quilts and products that I made and the people for whom these items were made. Many happy thoughts came to mind. Then I got the idea to make January mug rugs for my sons and their families. The mug rugs could be personalized by using the remnants from the quilts I had made for them and for my grandchildren and daughter-in-laws. So, I decided to make mug rugs with a coffee/cocoa/tea mug theme. I found this easy block pattern on Pinterest. This pattern was so easy. I cut out all the pieces to make 12 mug rugs. Then I sewed them up assembly style. Maybe I will organize the room tomorrow…maybe not. It might be a good day to go to the Botanical Gardens. Mom is holding the present my youngest son made for her. It’s been a few days since I have worked on my sewing machine. I plan to take a few more days off. This morning was spent going on an Acorn Hunt with my youngest grandchild. What better way to spend a morning! A few weeks ago, I purchased a Block A Day by Lucinda Ganderton. The first few days were spent perusing the book. The book is so well-organized, and so I started devoting time to reading the seven sections. Each section provides information in a reader friendly manner. The author states that this book provides “something for everybody”. It does seem to cover beginners to experienced quilters. There is a section with great directions for cutting out the patches. Most blocks have directions for both rotary and template cutting. I have never done any template cutting, and this is something I would like to try. After reading the section about fabrics, I started checking out my stash. The block patterns are grouped by color, so I began sorting my stash according to what I saw in the first color section of the books. At first, the idea of piecing a block a day seemed a bit overwhelming. However, after studying the book, it seems that this is something I could manage. I think that this project would provide me the opportunity to improve and learn new skills. It would be a challenge, but I think it could be enjoyable. It might be more fun if I could find other people who would like to do this. I know there is an online block a day project by Karyn Kerr . Originally, I had thought of trying this challenge. 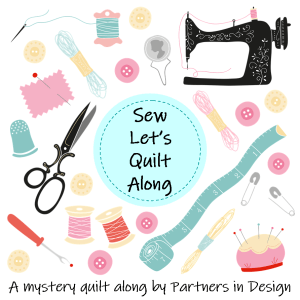 It would give me the opportunity to have an online community of quilters doing this project. But, I really like the blocks in Lucinda Ganderton’s book, so I decided that I am going to challenge myself with this project. These past three days have been crazy and hectic. There is nothing like having a cold front and a malfunctioning furnace happen at the same time! But these days were also very blessed. I was able to spend these days before Christmas with two very special friends. On Sunday, my friend Jeanne came for a visit. She is a former educator and the best teaching partner ever. Jeanne moved to Pfluggerville when she retired. We slipped right into conversation and it was as if we had not been apart for so many years. Jeanne is so very calm and wise. I love talking with her and learning from her. Jeanne is very creative and talented in so many ways. She made this Christmas decoration for me. Monday was spent with my friend, Nancy. We met at a mutual friend’s Halloween party back when we were about nine years old. We attended the same high school, and then we both graduated from the University of Texas. Any time I meet with Nancy, I learn new things and I get inspired to create! I have mentioned Nancy in previous posts. She has an Etsy account, Reynolds Creative Work . We spent the day, in a very cold house, watching the repairman, sharing ideas and having fun. I loved looking at the box of goodies from items she makes for her Etsy account. You can find these goodies on her Etsy site. Nancy is so very considerate. I had given her some burlap that I used for making prayer flags. I also had given her some lace from my mother’s stash bag. Nancy made this beautiful table runner with the burlap and with the lace. Then I chose these items that she made. She makes the cutest dogs out of felt and sweaters. Each dog has its own personality. I chose one for each of my youngest grandchildren. I just love the bow ties! Nancy also makes these beautiful, unique brooches. She uses felt, buttons, and sweater remnants. Nancy also makes bracelets made of sweater remnants. I had pulled one out for myself but somehow, I forgot to put it in my pile. Nancy had a bag of Christmas earrings that she made. Make sure you check out Nancy on Etsy. Read the great reviews on her site. They speak of the quality of her products and customer service. I am looking forward to more visits with my friends. There is definitely nothing more prized than true friends. My sewing room is a mess! I’ve been trying to finish all the projects that had a holiday deadline. I got a quilt mailed two days before the final deadline…yea! These are the quilts for my three grandchildren. I just finished binding them. Now, it is time to be with friends and family. I have scheduled a room reorganization day for December 26th! I need to prepare for next year’s projects.